Yocaher Professional Speed Drop Down Stained Complete Longboard is the best for its fast and smooth riding, great stability with tight turning radius. The Yocaher has dedicated to introducing high quality Longboards and as a result, it is comfortable to use for downhill, cruising and freeriding. It is designed to attain maximum speed. The highly concave curvature of this drop through ensuring that both the heel and toes of the foot of riders remain locked with it. The cut out of the deck allows the wheels to get maximum clearance. A rider can easily switch whenever he/she want due to its bidirectional design and no need to turn the board all the way. Dimension: 41.25″ L by 9″ W, 5″ H and Weight 8.2 Pounds. It has ABEC 7 chrome bearings. Because of its 41.25 inches long, it is sufficiently easy to control. Includes 70 x 52 mm Q- Ball wheels of 78A hardness level that make it very fast. Includes a black grip tape of premium grade 80A. It is perfect for professional Longboard riders. 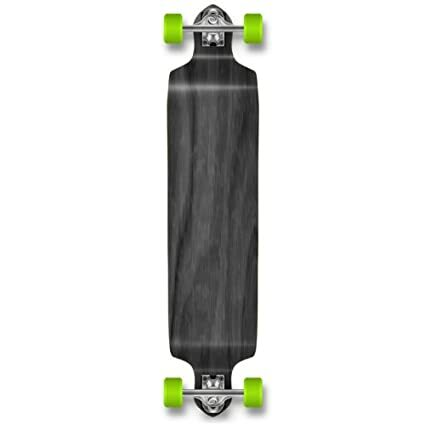 The Yocaher Professional Speed Drop Down Stained Complete Longboard is providing you an extremely easy riding. The centre of the deck of this board is very low and long enough with fairly soft wheels to provide smooth and soft riding. This result the low centre of gravity and helps to keep the body on it. No chance of falling due to highly concave curvature of this drop through. The perfect hardness level of the wheels is best for shocks and strain absorbing property. The super hard deck is extremely stable and provides secure, high speed cruising. Since the bearings are used to mount the wheels, the performance of the wheels depends on it. The Longboard has included reliable ABEC 7 chrome bearings. This will help you to improve faster. The ABEC 7 chrome bearings also add a smooth motion to the board and have a sufficient working life. The Longboard has made especially for the professional rider. But it can be used for both beginner and advanced level rider. Every riders can downhill ride up to speed of 35 miles/hour. It can withstand the weight up to 300 pounds. So if you have a heavy weight, it is the perfect board for you. The Q-Ball wheels having a dimension of 70 x 52 mm are better than other wheels. It provided required balance at the time of high speed secure riding. The 78A hardness level of the wheels provides great stability. The Longboard has a compact & a thick structure with beautiful graphic. Ensure a high level of safety, especially for downhill. The Longboard is designed for high speed. Available in wide range of colors. Low cost and safe to high speed riding. Bidirectional structure for easy switching. It has a good turning radius. This board is needed to be slowed down while turning. Due to thicker structure, it has less flex. The Yocaher Professional Drop Down Stained Complete Longboard has become one of the reliable longboard for the professional rider. You can keep trust on Yocaher longboards and they have included with some special features in this board resulting a great value ride. What Are the Best Snowboard Goggles for Both Men and Women? You guys got the best passionate person of longboarding on earth – I’m Sammy. My life and my soul is all for Longboarding. Suit up! I’ll show you! LongboardBrand.com is a participant in the Amazon Services LLC Associates Program, an affiliate advertising program designed to provide a means for sites to earn advertising fees by advertising and linking to amazon.com. Amazon, the Amazon logo, AmazonSupply, and the AmazonSupply logo are trademarks of Amazon.com, Inc. or its affiliates.